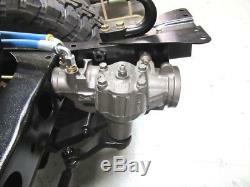 THE BTB NAMED TRITON STEERING BOX IS A CUSTOM BUILT HEAVY DUTY SAGINAW POWER STEERING BOX. FOR 58-10/84 FJ40 AND FJ45 LAND CRUISERS. IT HAS A VARIABLE 16-13 TO 1 RATIO PRODUCING BETTER STEERING CHARACTERISTICS FOR BOTH ON AND OFF-ROAD SHORT WHEEL-BASE VEHICLES. THIS 3-3/8 LOCK TO LOCK 3-BOLT MOUNTING BOX HAS A HEAVY DUTY TORSION SHAFT WITH A 3/4-30 SPLINE INPUT SHAFT AND USES O-RING STYLE CONNECTIONS. WE HAVE MANY OTHER ITEMS AVAILABLE NEW AND USED. IF YOU DO NOT SEE WHAT YOU ARE LOOKING FOR PLEASE MESSAGE US AND WE WILL GET THE ITEM LISTED ASAP IF STILL AVAILABLE. The item "Saginaw Power Steering Box Triton Heavy Duty Aftermarket New FJ40 FJ45" is in sale since Wednesday, April 25, 2018. This item is in the category "eBay Motors\Parts & Accessories\Car & Truck Parts\Suspension & Steering\Steering Racks & Gear Boxes". 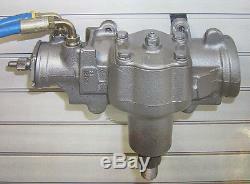 The seller is "landcruiserparts" and is located in Henderson, Nevada. This item can be shipped worldwide.